Here is the much awaited Nougat 7.0 ROM for Yu Yuphoria CM14 (CyanogenMod 14). In addition we also have the Lineage 14.1 for Yuphoria. For latest updates, stay tuned to the Lineage OS device list page. In addition, we have an initial development version of Android Oreo for Yuphoria, you can try if you are interested in. Also we have the Nougat 7.0 AOSP ROM for Yu Yuphoria and LineageOS 14.1 for Yuphoria. 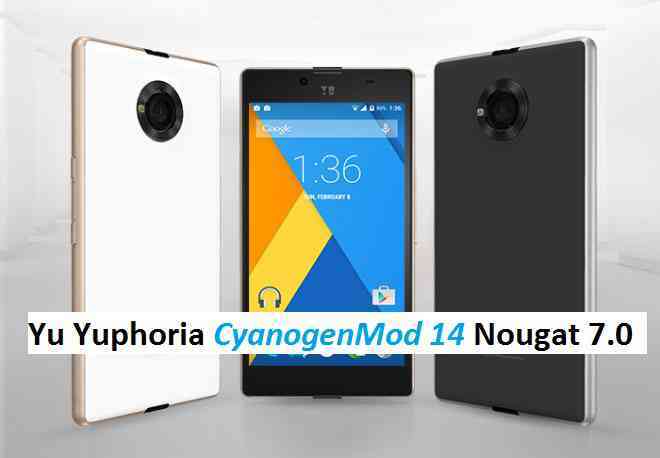 And this time CyanogenMod 14 for Yu Yuphoria for CyanogenMod 14 has come and is brought to you by developer AniruddhChandratre (ace312). Installing a custom ROM on a the Yu Yuphoria may require the bootloader to be unlocked and a Custom Recovery on the Yu Yuphoria, which may VOID your warranty and may delete all your data. Before proceeding further you may consider backup all data on the phone. You are the only person doing changes to your phone and I cannot be held responsible for the mistakes done by you. TWRP recovery download link for Yu Yuphoria (lettuce).- Follow this guide: How to Install TWRP on Yuphoria using Fastboot (This requires an unlocked bootloader). Download and Copy the Nougat GApps and CyanogenMod 14 Nougat ROM ZIP to Yu Yuphoria. – Here is a guide explaining how to wipe data using TWRP recovery.This will delete all your data on your phone. You may consider complete backup of your phone data or take a NANDROID backup of the current ROM. First flash the Yu Yuphoria CM14 ROM ZIP from device. Reboot and Enjoy the CyanogenMod 14 Nougat ROM on Yu Yuphoria. Stay tuned or Subscribe to the Yu Yuphoria forum For other Android Nougat ROMs, CyanogenMod 14 ROMs, other ROMs and all other device specific topics. The development thread for the Yu Yuphoria CM14 ROM is here. also unable to istall gapps…. Hello Sahmad, I understand your frustration. To be able to install GApps, you need to flash the Gapps immediately after flashing the ROM without rebooting to the ROM. I guess you have rebooted the phone after flashing the ROM and then you have installed the GApps. The CM Setup Wizard does not work in many CyanogenMod 14 ROMs including Yu Yuphoria. This might be a BUG from CM as CM 14 is still in bringup stage. But as a workaround for now you can delete the CyanogenSetupWizard folder from /system/priv-apps to bypass the initial setup. Yuphoria uses Qualcomm MSM8916 Snapdragon 410 64-bit architecture, so arm64 is the one you should try, which you have downloaded. Cool !! Try downloading another GApps package like pico, micro or something else. IMPORTANT:: DO NOT REBOOT AFTER INSTALLING THE ROM AND BEFORE FLASHING THE NOUGAT GAPPS. IF YOU HAVE DONE SO, THEN REINSTALL THE ROM AND GAPPS. I mean to say, flash the Nougat GApps immediately after flashing the ROM without rebooting the phone.